ASI made Southwest Family Center, Mitchell Elementary School & Presbyterian Children’s Services combined dream a reality by making the parking lot into a playground for youth. 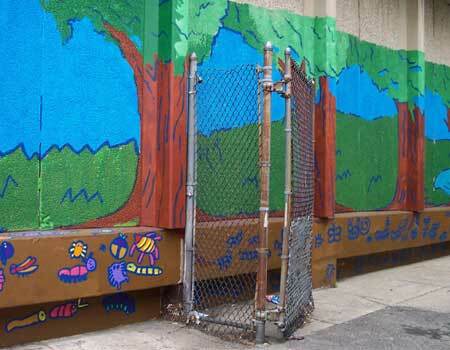 Art Sphere Inc. created twelve murals over the course of three years in collaboration with various volunteers including: Wayne Presbyterian Church, Leeway Foundations in support of Kristin Groenveld and the WOO Grant, CHOP, Philadelphia School District, local leaders, educators, administration, and custodial staff. Working with the school district, educators, and administration, ASI incorporated mural matching curriculum, recommended reading lists, and important educational themes into the arts programs. Themes included: migration of monarchs, nature and life cycles, gardening, insect identification, nutrition, flower and animal identification, counting, days of the week, the alphabet, African folk tales, and team work. Art Sphere Inc. especially appreciates projects like these where art is used to enhance the learning environment and sparks the imagination and instruction of students’ minds!